NetFlow is a popular networking protocol created by Cisco for the purpose of collecting IP traffic information and monitoring traffic on the network. Using Netflow, a snapshot of network traffic flow and volume can be built by analyzing flow data. Using a NetFlow collector and analyzer, you can see where network traffic is coming from and going to and how much traffic is being generated. What is a Netflow Collector? Cisco routers, switches and other devices that have the NetFlow feature enabled generate NetFlow records. Netflow records can be exported from the device and collected using a NetFlow collector. The NetFlow collector then processes the data to perform the traffic analysis and presentation in a user-friendly format. NetFlow collectors can take the form of hardware-based collectors (probes) or software-based collectors. One popular choice for collecting and managing Netflow traffic data is the Solarwinds NetFlow Traffic Analyzer. 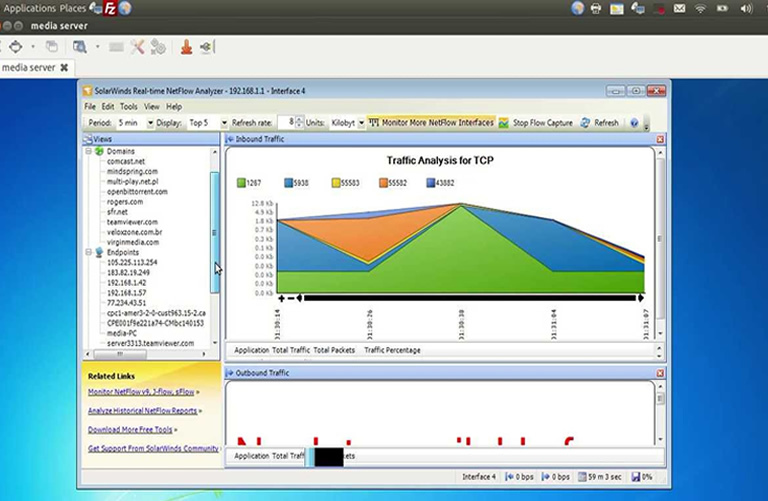 The free NetFlow Traffic Analyzer from SolarWinds allows you to sort, graph, and display data in various ways that allow you to visualize and analyze your network traffic. It is great for tasks such as seeing network traffic by type and for specified periods of time, and running tests to see how much bandwidth various applications consume. This free tool limits you to one NetFlow interface monitoring and keeps only 60 minutes of data. This Netflow Analyzer from SolarWinds is a powerful tool that is definitely worth the download. Colasoft Capsa Free allows you to identify and monitor specific protocols. Colasoft supports over 300 network protocols, and sllows you to create customizable reports. It includes email monitoring and a TCP timing sequence chart, all combined into you own customized dashboard.